Fruits and vegetables react in many different ways to light from artificial sources. The most significant category of products in the produce segment is root vegetables. Radishes, carrots, beets, turnips (rutabagas) and others will begin to green under the influence of visible and non-visible radiation from in-store lighting. "At high enough levels the glycoalkaloid found in potatoes known as solanine can cause irritation of the gastrointestinal tract, impairment of the nervous system, and ... birth defects." 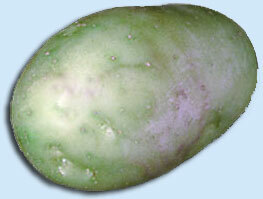 Of critical importance is the potato category which produces toxic levels of the glycoalkaloid solanine during the greening process. Glycoalkaloids are toxic to humans; the lethal dose is 3-6 mg per kg of body mass. Improper display and lighting of potatoes contributes to accelerated greening and represents a substantial food safety and economic risk to food retailers and consumers. Produce departments and farmers markets can protect the appearance and shelf life of organic and non-organic fruits and vegetables on display by using a low radiation light source like PROMOLUX lighting. Fruit and Vegetable General Processing. Chapter 3: Deterioration Factors and Their Control. Mircea Enachescu Dauthy. FAO Agricultural Services Bulletin No. 119, Rome 1995. Read the full article here. Green Potatoes: the Problem and the Solution. Alexander D. Pavlista. Cooperative Extension, Institute of Agriculture and Natural Resources, University of Nebraska-Lincoln. G01-1437-A. Read the full article here. "As a rule, fluorescent light above 75 foot-candles exposure at room temperature (68° F) for three to five days will start the greening process; however, light intensity as low as 5 foot-candles and light durations as short as 12 hours can cause greening of a few potato varieties such as Kennebec." lanine had increased ten-fold, only two pounds could cause a reaction. Potentially high levels for a 100-lb and 50-lb person would be 16 and 8 ounces of a fully green potato, respectively." "Potatoes containing more than 0.1 percent solanine (.01 oz / 10 oz potato) are considered unfit for eating." Potato Glycoalkaloid Toxicity: Solanine. Andrew Montario. Cornell University. Read the full article here. Glycoalkaloids. from the World Potato Congress Newsletter, July 1999. Read the full article here. Greening of Potatoes. Wayne Vandre. University of Alaska Fairbanks. Read the full article here. Potato : Green Tubers and Sprouts. Updated by Cherlin Johnson, M.D. Medical Encyclopedia, Medline Plus: A Service of the National Library of Medicine and the National Institutes of Health. Read the full article here. Definition: Poisoning caused by consumption of green tubers and/or new sprouts of the potato plant. Poisonous Ingredient: solanine (very toxic even in small quantities). Symptoms: hypothermia (lower than normal body temperature), paralysis, shock, fever, slowed breathing, dilated pupils, vision changes, stomach or abdominal pain, vomiting, diarrhea, slow pulse, headache, delirium, loss of sensation, hallucinations.